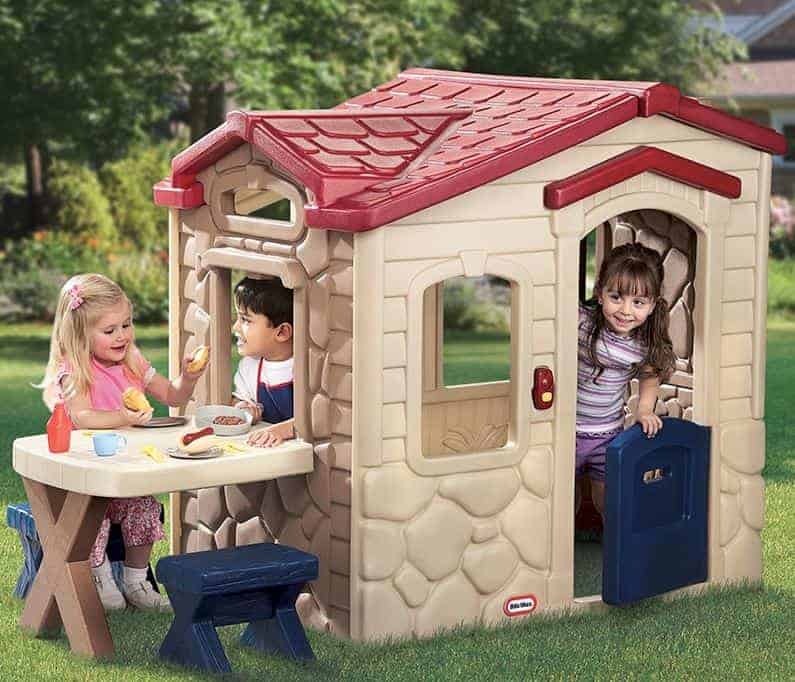 The 5’6 x 3’1 Little Tikes Picnic on the Patio is a playhouse that is going to provide a long lasting and safe place for your children to have a wonderful time playing and encourage them to share with their friends and use their imagination. 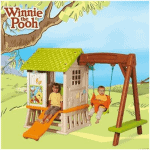 This is a charming and just generally adorable playhouse that is made to have the look of a little barn house and it will make you smile every time you see your kids playing inside it. It is not just the inside with its cupboards, moulded fireplace and stove where the children can have a lot of fun. There is a little patio table outside the window and it even comes with a whole lot of accessories for them to enjoy. 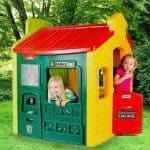 This is a playhouse that has been made for kids to play with and really have a great time with. It is made from very durable moulded plastic which gives it the lovely look that it has, but also makes it be very low maintenance and something that is going to last for lots of years. This is a playhouse that has just so much personality that the children are going to have the time of their lives making use everything that it has to offer. Kids will want to spend 24 hours a day in here! Here we have a great way to get the kids excited to play outdoors and have a lot of fun by themselves or with their friends. The 5’6 x 3’1 Little Tikes Picnic on the Patio is one of the most fun and charming little playhouses we have ever seen and we are sure kids are going to be all over this. The pictures do not really do justice the size of this playhouse. It does not take up a lot of space, but it actually has a lot of space to play inside. There is 5 feet 6 inches of width and 3 feet 1 inch of depth this is enough size to easily fit in a couple of kids. Inside there is a moulded fire place, stove and cupboards for them to enjoy and let their imagination run wild. The playhouse really does look amazing and we are sure you will love having it in your garden as much as the children do playing with it. 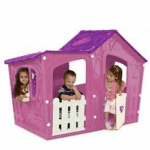 The roof of the playhouse is made with very strong plastic that is rather thick and very durable. The roof is done in an apex style which is not just there to look pretty. It is there to make sure anything that your kids leave inside does not get wet through the roof. Little Tikes have used a red plastic for the roof and they have moulded these cute little slates onto the roof that we just find adorable. The whole of the playhouse is made from this child safe and very strong moulded plastic. We love this for a kids playhouse as it is just so strong and will make sure that it can first of all take a lot of abuse for many, many years, but it also makes the playhouse lightweight enough that you can move it around the garden easily enough. Rather than just giving the playhouse some flat plastic walls, Little Tikes have gone the extra mile by giving the walls a very pleasant stone effect. Here we would normally talk about a frame, but as this is made from very strong plastic there is no need at all for a frame. This does not have any kind of negative effect on the durability of the structure so there is no need to worry. 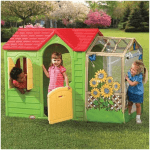 The idea of this playhouse is that there is no need for a floor, you would just place this on the grass or on some kind of concrete surface. This makes moving the playhouse around very easy to do and also does help keep the price down a little bit. The 5’6 x 3’1 Little Tikes Picnic on the Patio does look fantastic and part of the appeal of this for many people we are sure is that it is so incredibly low maintenance. This type of plastic requires no treatment at all. You can just leave it out all year round and have no issues with it. Of course if it does start to get a bit grubby or dirty then you may want to clean it. Well a blast with the garden hose or a bucket and sponge is all you need to do. 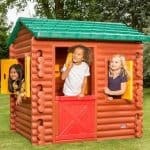 You get a good one year warranty with the playhouse which will cover you if anything does go wrong with the materials. It is impossible we feel not to love the door on this playhouse. It is a barn style door which is just so cute and very easy even for younger kids to open. The door is very solid which is great as we are sure the children will love to hang on this door. There is a widow next to the door and there is one round the side of the playhouse. The window on the side of the playhouse is actually a major feature of this as it leads out to a little patio table. The kids inside can pretend they are making a nice meal and then pass it out to the patio table through the window. We are sure kids are going to have a great time pretending to serve food through the window. This is a pretty open playhouse and that is fine with us even though it means there is no way to lock or secure the door. This is made for little kids to play inside so you want to be able to keep an eye on what they are doing so the lack of privacy is not something we are going to put the playhouse down for. The age range of kids that this is aimed at we are sure are not going to care about people being able to see what they are doing. This kind of strong moulded plastic does not allow for any customisation, but that is not a big deal as it has a really good look to it anyway. 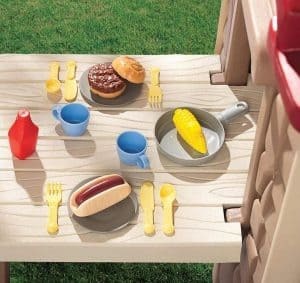 Wow is the 5’6 x 3’1 Little Tikes Picnic on the Patio just loaded with extras and best of all you do not have to pay for any of them as they all come with it. 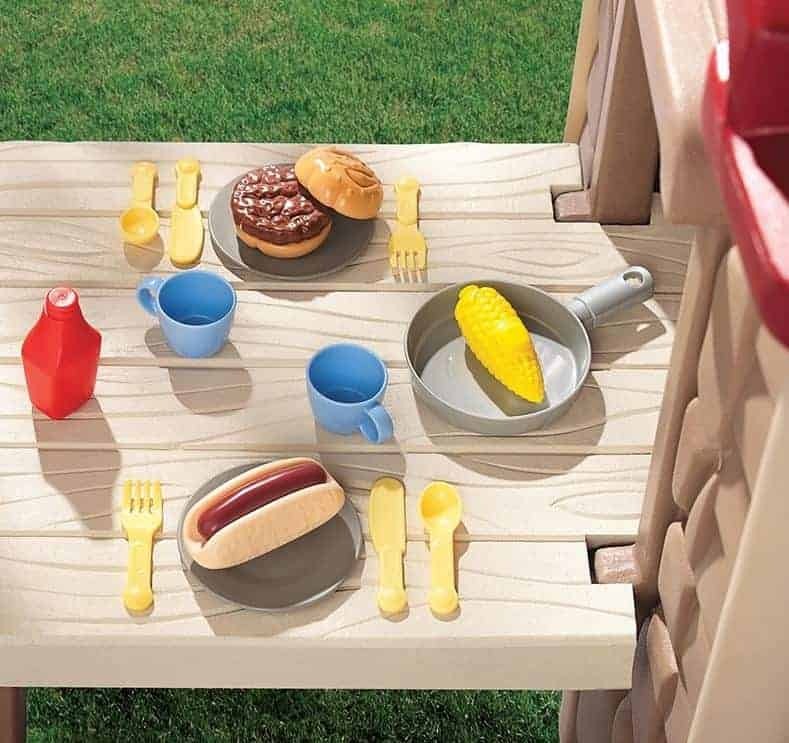 To start with we have that little patio table that is on the outside of the playhouse. That is amazing right there, but there is more. This comes with a 19 piece accessory pack and we are positive the kids are going to love to make use of. This pack has a few plates, knives, forks, a frying pan, plastic food and a couple other things as well. We can just imagine all the fun the children are going to have pretending to cook up this food inside the playhouse and then serving up to their friends sitting round the table outside. There is even an electric doorbell that with just three AAA batteries will ring and play different chimes. While moulded plastic may not sound like the most high quality material in the world. We can tell you that this actually is very high quality and it did impress us a great deal. This is a playhouse that is going to last for lots of years. This moulded plastic is going to be able to take lots of rough and tumble and be able to be moved around your garden without every getting weak and flimsy. We feel that the play room that is inside is fine, but the added patio table makes this a playhouse where playing just outside it is going to be just as much fun. As well as being very low maintenance, you will have no trouble putting this together at all. It is pretty much a case of slotting things together and screwing the odd thing in and that is all there is. 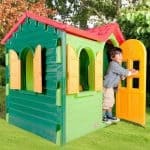 We know that something made from plastic having a price tag of over £200 may seem high, but this playhouse will still be standing strong long after your kids are too big to get inside so you are getting a very well made playhouse that is going to certainly give you good value for money. 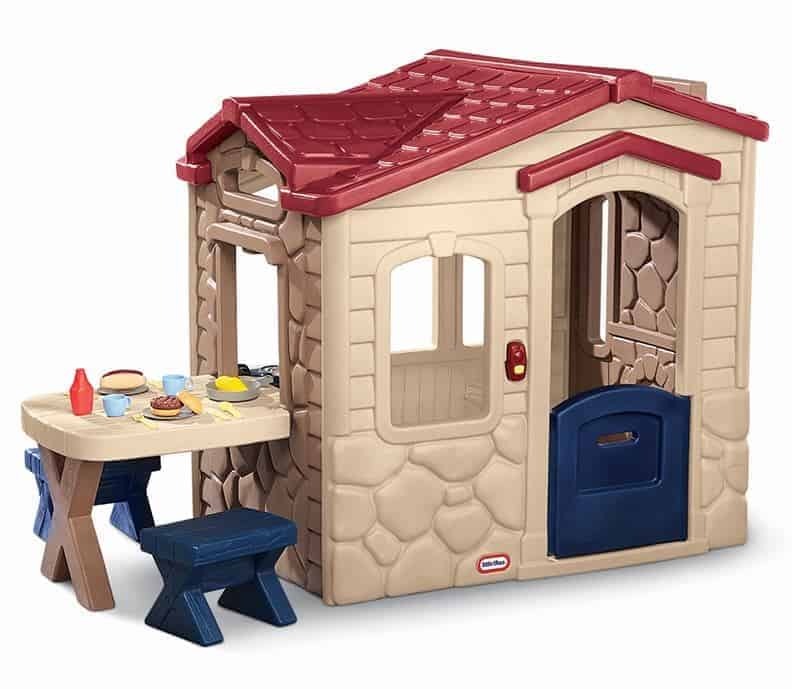 Final Thoughts: The 5'6 x 3'1 Little Tikes Picnic on the Patio is a playhouse that we feel kids are just going to go wild for the moment they see it. This is more than just a shell for them to play inside. It is full of lots of fun little features that will encourage them to play and have a great time with their friends or even if they are just playing with their teddies. We love how durable the plastic is and how it stands up to the bad weather and will last for lots of years. If you want to make sure the playhouse you buy is going to provide many hours of fun then we feel this is something you should strongly consider.